What type of jobs people do after MBA? MBA has become the most popular master’s degree worldwide. Nowadays in the corporate world, this degree has been recognized to be a necessity for individuals to get promoted to the top management levels. Millions of students worldwide are reaching out for this degree in order to gain corporate success in the future. 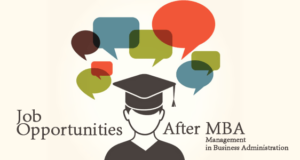 According to The … Continue reading What type of jobs people do after MBA?